Five of the UK's biggest food firms are to include details of ingredients' guideline daily intake amounts on the front of their packets. Kraft, Danone, Kelloggs, Nestle and PepsiCo say the details on calories, sugar, fat, saturates and salt will allow more informed choices to be made. The move effectively scuppers plans for a nutritional "traffic light" system favoured by the Food Standards Agency. The watchdog backed the green, amber, and red labels for their simplicity. A 12-week consultation by the agency on the multiple traffic light system, which shows at a glance if food has high, medium or low levels of fat, saturated fat, sugar and salt, ended on Wednesday. The agency is due to give its decision on what it intends to recommend to manufacturers in March but can only urge them to adopt a system voluntarily. Ministers want to introduce the food alerts by 2006, after first proposing the idea in the Public Health White Paper last year. So the decision by the makers of some of Britain's most popular foods, including Walkers crisps, KitKat, Dairylea and Kellogg's Cornflakes, may be seen as divisive. The group says they are discussing with other manufacturers the possibility of the scheme becoming the industry standard. A key feature of the guideline daily allowance (GDA) scheme involves giving a clear indication of what percentage of an individual's recommended daily amount of each of the five key nutrients are contained in a portion. However, if the package is too small, a smaller logo will appear with more information on the back. A spokeswoman for the group of firms said: "The research we have done has shown that the GDA with a percentage is more useful for consumers than having the traffic light system." Martin Glenn, chief executive of PepsiCo, added: "We know from customers that they don't want to be told what they can and can't eat. However, they do want easily accessible information to guide their choices. "By having information in this format on the front of packs, consumers will be able to compare similar products while they are shopping and make easy choices about which products best meet their dietary needs." The Food Standards Agency said it was encouraging that manufacturers were taking the need to improve food labelling seriously. But a spokesman warned: "However it is important that we all work together to deliver a scheme which works for consumers across the whole food industry. "Consumers tell us they want a straightforward labelling scheme, established by an authoritative and trusted source, which will show them at a glance if a food contains high, medium or low amounts of fat, saturated fat, salt or sugar." It added that it still hoped the food industry would adopt its recommendations after a final decision is made in March. Melanie Leech, director general of the Food and Drink Federation, which represents manufacturers, said there was clear agreement across the industry that GDAs were the best way to provide consumers with information about their food. Steve Shaffelburg, policy manager at the British Heart Foundation, said it was essential that the entire industry acted as one, as multiple labelling systems would inevitably lead to confusion. What do you think of new labels? "We strongly support the multiple traffic light labelling model proposed by the Food Standards Agency." He added that this clear nutritional signposting would spell out the value of food on our plates and is essential if people are to make informed choices about food. Public Health Minister Caroline Flint said: "We welcome these first steps by industry and retailers to introduce front of pack labelling but the test will be which system works best for shoppers and for health." Liberal Democrat health spokesman Steve Webb said it was "heartening" to see action from the food industry. But he added: "Bombarding busy shoppers with numerous different figures will only serve to make healthy eating harder." Do you find food labelling confusing? 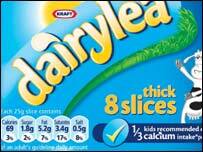 What would make food labelling clearer for you? Send us your comments using the form below.